* The Editor’s Page- “Rum Responsibilities” by Luis Ayala. * World Rum News- Rum news that occurred in the month of July. * Upcoming Events- Notices of upcoming spirits events throughout the world. * The Angel’s Share- Featuring Cockspur 12 Bajan Crafted Rum (80-Proof), Pecan Street Rum (80-Proof), Kaua'I Gold Hawaiian Rum (80-Proof) and Ricardo Dark Rum (80-Proof). 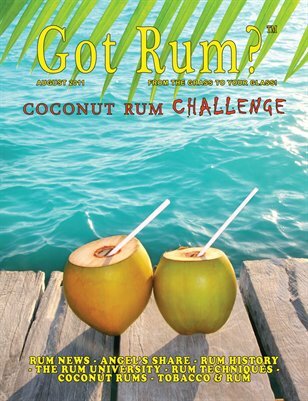 * Coconut Rum Challenge- Featuring the Most Complex, Smoothest Pleasure, Boldest Taste and Most Aromatic. * Exclusive Interview- Interview with Mr. Roberto Garcia Botran, President of Industrias Licoreras de Guatemala. * Rum In History- What happened in the month of August throughout history from 1492 – 1740. * The Rum University- This month we look at the Classifications of Rum- Part 5. * Rum Techniques- Covering the Organoleptic Assessment of Rum- Part 5. * Tobacco and Rum- Featuring Ashton Majesty 6 x 56 cigar and Cruzan Single Barrel rum.